Sweet OliveEvergreen shrub. Moderate growth rate. Dense, broad oval form. Medium-sized, medium-green..
Sweet OliveEvergreen shrub. Trained to grow on a trellis. Moderate growth rate. Dense, broad oval fo..
Holly Leaf OsmanthusEvergreen shrub. Spiny edged, glossy green leaves. Resembles English holly. Late..
Holly Leaf OsmanthusEvergreen shrub. Goshiki translates from Japanese as "five colors". 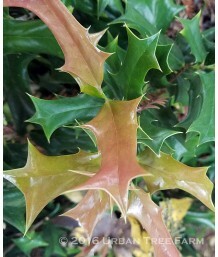 Its new leav..
Holly Leaf OsmanthusEvergreen shrub. Moderate growth rate. 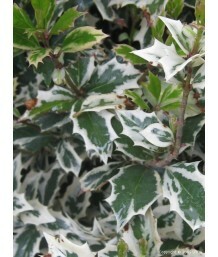 Densely-rounded form with stiffly-upright..
Variegated Holly Leaf OsmanthusEvergreen shrub. Spiny edged, glossy green leaves with creamy white e..